Few images are as dramatic as that of an entire nation being simply washed off the face of the planet. Like a modern-day Atlantis, a country simply sinks beneath the ocean’s waves, leaving thousands of people stateless, bereft of a home or national identity. According to a new documentary, which just took home the top Audience Award in its category at the Toronto International Film Festival (TIFF), this is exactly what Maldivian president Mohamed Nasheed fears his people will become – refugees from a warming planet. 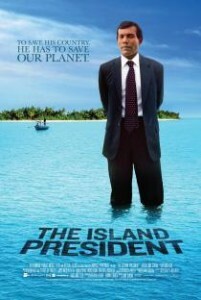 The film, The Island President, follows Nasheed’s long path to from obscurity to the international stage. A true populist, Nasheed fought the Maldives’ notoriously corrupt government system in a long campaign for legitimate democracy, until he was swept into office on a tidal wave of support at the age of 41. His battle was hard-won, however; he suffered years of torture and imprisonment throughout the 1990’s due to his pro-democracy activism, beginning with an article he had published in a magazine at the young age of 23, which accused the then-government of rigging elections. Once Nasheed attained the presidency, his activism took on a far broader scope – and the stakes became infinitely higher. Upon taking his office, his overwhelming priority became bringing attention to the plight his country’s 1,200 coral islands and cays would suffer, should sea levels rise even a small amount due to climate change. The country, one of the lowest on the planet, is an average of just 1.5 metres above sea level, with sandy soil that is highly vulnerable to erosion. The situation is seen as urgent by many scientists; the United Nations’ environmental panel has warned that, at the current rates of sea level rise, the country will be completely uninhabitable by 2100. For years, the president has been public about the Maldives’ efforts to purchase land from other countries in case of a deluge. At one cabinet meeting, Nasheed reportedly said that: “We do not want to leave the Maldives, but we also do not want to be climate refugees living in tents for decades. Sri Lanka and India are our targets because they have similar cultures, cuisines and climates. Australia is also being considered because of the amount of unoccupied land available.” In early 2011, a new tactic was announced to protect the country from rising waters– he was in talks with the government of Bangladesh to acquire millions of tonnes of sand to fortify the islands. 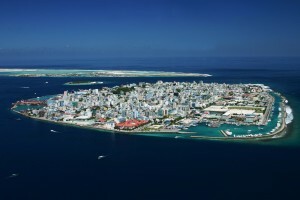 Through the aid of NGOs like Unicef and 350.org, Nasheed also became a strong international voice for stricter carbon emissions rules, and more financial support from world powers for small countries impacted by global warming. Some of his efforts have been extreme; in 2009, he famously held a cabinet meeting underwater, with the participants in scuba gear. If Nasheed has demonstrated one outstanding talent since taking office, it has been getting the attention of the international community – and with warm reception of The Island President at TIFF, his campaign against climate change may have gained a whole new audience.